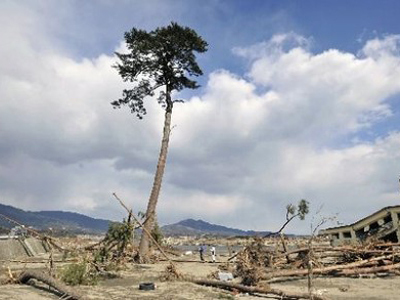 On the coast of Japan’s Iwate Prefecture, overlooking the merciless ocean, stands a lone pine tree where there was once an evergreen forest – an enduring symbol of the country’s continuing struggle to recover from March’s earthquake and tsunami. 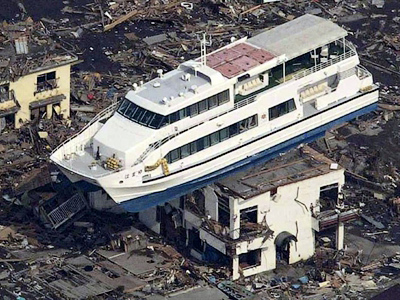 ­The pine tree’s home, a tiny stretch of seashore between the great water and Japan, was swallowed to an inch by the wave, which, rising at places to 40 meters, smashed on the country’s eastern coast on March 11. The wave left the 70,000 black and red pines on the once-frequented Takata-Matsubara beach lying uprooted, in timber and flinders. The Place of Scenic Beauty, planted 350 years ago to protect the town of Rikuzen-Takata from severe winds, was wiped off the map – all except for a single pine tree. Rikuzen-Takata, missing a third of its 23,300 residents and most of its buildings, has pledged to save the last standing tree. The disaster and the excess of sea salt brought on by the ocean water have damaged the roots and core and poisoned the white sand. To fasten the trunk, the tree was wrapped into a special cloth which also protects its scratched bark. The guarding of the new symbol of hope and reconstruction has been taken over by the Greenery Research and Development Center in Tokyo. The center says that six months into the disaster, the tree has gotten worse: the pine cones are now discolored and the leaves have turned brown. A study in October will show if the 10-meter-high, 200-year-old tree can be revived at all, reports the Tokyo Times newspaper. In the meantime, officials are forbidding anyone from approaching it. Still, volunteers are working hard to purify the sand and grow the whole wood anew, says Eugenia Nisikawa, a Kyoto-based blogger. 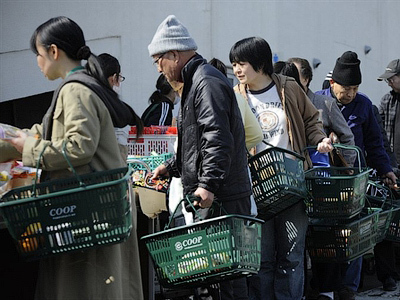 The seeds collected by Rikuzen-Takata residents have grown into an estimated 300 nurslings, which ecologists have declared sufficient. The wreckage left from the other trees was carefully picked up and used to write the names of everyone found dead or missing in the March quake and the tsunami that followed. The pine planks were sent to Japan’s former capital, the ancient city of Kyoto, where they were burned during the traditional Obon festival. The Japanese believe that souls of the dead rise to the skies with the smoke of Obon fires. The former town of Rikuzen-Takata may be no tourist attraction now, but the new souvenirs coming from there – t-shirts and cookies – show the proud pine tree and say: Never Give Up! 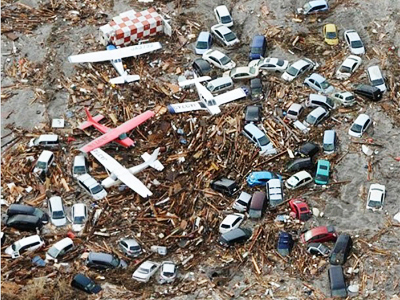 In Rikuzen-Takata, as well as in most eastern Japanese cities hit by disaster, most debris has now been either cleared away or organized into big piles. Survivors – many of them still living in shelters – have started growing sunflowers. These plants are believed to absorb radiation. Many say the bright yellow flowers, too, represent the souls of the more than 20,000 victims of the March disaster that wiped out entire towns and triggered the worst nuclear accident since Chernobyl.